I read this article and found it very interesting, thought it might be something for you. The article is called Best 15 Beaches You Can’t Miss in Brazil and is located at http://trip-n-travel.com/listicle/22573/. Brazil is the land of gorgeous beaches and it is a perfect vacation place. If you decide to go to any coastal city or town, you will not be disappointed. The beaches are spectacular in Brazil – they are generally pristine and very natural, especially in the lesser populated areas. We have selected the best beaches in Brazil you simply have to visit, so keep reading. This volcanic archipelago is settled 350 kilometers away from the coast of Brazil and it is a true paradise. The waters are crystal clear and the beaches are natural. It is a perfect place for divers, surfers, swimmers, or anyone who wants to enjoy beautiful and untouched environment far away from the civilization. Copacabana is probably the most famous beach in the world. It is a synonym for Brazil and long hot summers. Located in Rio de Janeiro, this stretch of sand is visited by thousands of tourists every year. Locals are very proud of this beach and they often come here as well. Even though Ipanema is not as famous as Copacabana, it is still an amazing beach located in Rio de Janeiro. This place is known as an alternative to Copacabana and it gathers people from all around the world. Both the water and the surroundings are spectacular – all you need to do is place down your towel and enjoy your day at Ipanema. Located in Fortaleza, Praia do Futuro is a magnificent beach that is always kept clean and polished. It is large enough so you can avoid the crowd and there are plenty of restaurants and shops around, so if you get hungry, you will be able to grab a quick bite in no time. Even though Flamengo Beach is in a large city of Salvador, it is perfect for a relaxing afternoon far away from the constant city noise. It is less crowded than other beaches in the same area around this place and you will absolutely love the shoreline and the water here. 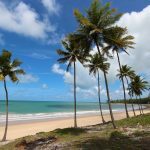 If you are looking for a picture perfect beach with gorgeous white sands and an endless horizon, Taperapua Beach in Porto Seguro is the place for you. It is large enough so you can find your own little quiet place, but you can always go where the people are and join in the various beach activities. Praia de Ponta Negra is located near Natal. Strong winds make this place ideal for surfers and windsurfers, but this doesn’t mean you can’t visit as well. The water is strikingly blue and since this place is often not too crowded, you will be able to relax and fullt enjoy your beach outing. This small fishing village is located south of Rio de Janeiro and it is an undiscovered gem of Brazil. Tourists are slowly learning about this place and you should do so too. The beaches are stunning with fine sand and crystalline waters. The town itself is very interesting because it still has buildings from the colonial period. Located in Guaruja, Praia de Pernambuco has very calm and warm waters that are children friendly. It is a perfect location for your family vacation and you will be able to enjoy the ocean and the sun peacefully. It is away from the city and you will have to find a transport to there, but it will be worth it. If you happen to be in Santos, Gonzaga Beach is an absolute must-see. Even though this is a city beach, it is kept in perfect order. The place is well equipped with all the facilities you need and you will be able to find food and other necessities nearby without walking too far. Praia do Rosa is a perfect surfing spot far away from any urban areas. This beach is all about relaxation, music, water sports, and sunbathing. There are plenty of locals here and tourists are not very common. But don’t worry, you will be welcomed to this paradise if you decide to spend your vacation in Praia do Rosa. This white sand paradise is definitely not crowded and you will be able to find your spot on almost every beach here. The shallows are full of reefs and you can dive in and explore these natural formations. 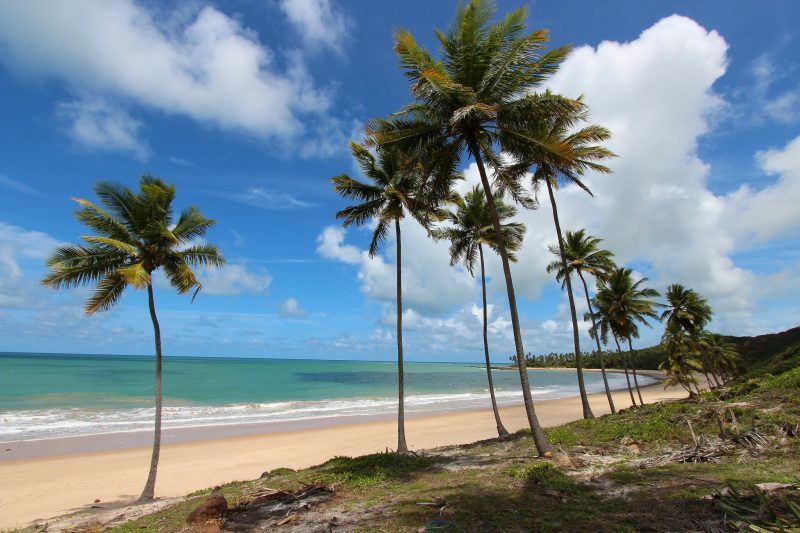 Alagoas is a place for you if you long for a quiet time during your holiday in Brazil. If you are looking for something completely different and want to experience the true beach life in Brazil, Corumbau should be your stop. It is very remote and you might travel a bit to get there, but you will be amazed once you arrive. The general look and feel of this place is otherworldly. This island formation near Salvador is an isolated piece of heaven. The majority of visitors stay in the largest island city called Barra Grande, but you can always opt for another type of accommodation such as bungalows or a camp. It doesn’t matter which option you choose – you will be able to enjoy stunning beaches and see-through waters. Ilha Grande is an island south of Rio de Janeiro and it is a perfect combination of sea and greenery. The beaches here are often regarded as the most beautiful ones in the entire Brazil and they will definitely take your breath away. This place is worth a visit so make sure you check it out. Brazil has so many wonderful beaches and the majority of them are outside of the large cities. The beaches are kept clean and you will be thrilled with any trip decision you make. So grab your towel and head to the beach!